Help! My Wesite Has Disappeared! Help! 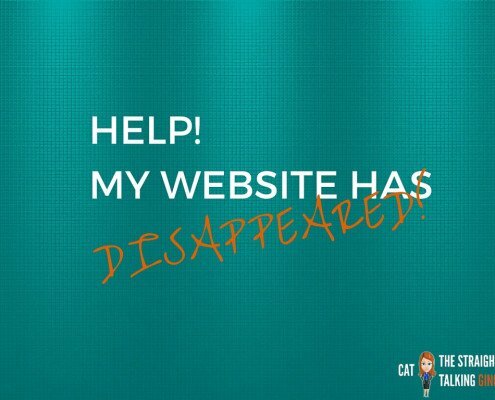 My Website Has Disappeared?! My site is finally up and projected into the world. A labour of love but I am so proud of it, even if I do say so myself. I took executive control over my website and mastered enough of the basics of wordpress to make me feel, well, kind of competent. Yes I’m a control freak and I like to do things my way. I’m not a bad person, I don’t think? (ahem), but boy do I need to sail my own dinghy and make anyone walk the plank that doesn’t share my vision of website amazingness. I absolutely love having the control over making my own graphics, uploading them and slotting them in exactly where I want them in blogs or sales pages. It’s so much fun using picmonkey and canva, yes I am fully aware I should be doing ‘real work’ but hey I love the creativity too. It’s so very satisfying. You can’t beat being able to tweak anything on your site in a few mins. versus waiting days or weeks to wait for the developer to do it, never mind the costs involved every time I have a creative brainwave. Cat Paterson : Straight Talking Ginger Tweet this out! A level of smugness had set in. My site was up, I wanted to show it off, along with my new course sales page, in all its glorious straight talking gingerness. ‘Cat, we can’t seem to see your sales page. to bring me down a peg or two. As you can tell, my reaction was neither relaxed or professional. I went ballistic…in the safety of my own home and at myself, I may add. The kind of level 11 balistic that makes your ears pop, your eyes nip and every living thing around you dive for cover (the cat, I’m sure, is still a bit traumatised). Ironically, I had just been writing a lesson for my course on cyber security, how to protect your stuff. That’s something I’m good at, something I’ve got covered?! yeah, thanks universe! Talk about a slap around my ‘cyber security know how’ chops. Frantically I contacted my hosting service, who have the most amazing customer service, they are called a small orange. They responded by email immediately and searched for the backups that are automatically taken off the site each week. Unfortunately, I had done a bucket load of changes and the backup was useless, aargh! Fortunately, I back up my own site weekly to my amazon S3 cloud. Phew! They also gently pointed out that I had added a piece of code in the wrong place – and there was me fancying myself as a wordpress afficionado…not! Imploding of brain and business duly avoided! (and cyber security ego bruised but not fatal). 1) Don’t faff around with bits of code if you have no clue how to use it. Crikey I might have created skynet without even knowing! 2) Back up, Back up, Back up…everything digital. Get organised, get a way to do it and then do it! 3) Get a great hosting service like a small orange. When you are in the middle of a melt down and the pins and needles in your head are jagging like a jaggy thing, you need the kind of customer service that can talk you off the ledge without making you feel like a total idiot…it’s a rare but beautiful thing. Because dear friends, if you don’t protect your stuff, all your left with is a blank screen, a broken creative heart and a battered ego. Oh, and potentially no business! …then check out my Cyber Security[basics] for Small Business which includes 10 mini lessons on how to protect your gorgeous stuff properly and, most importantly, what to do to protect your gorgeous digital world. Over 1200 small business owners have already taken the course and can’t be wrong. We already know that trying to add in code to wordpress when you are not a coder is lesson number 1 . You can have that tip for free! Cat spent years working in intelligence analysis for a national intelligence agency. She became an accredited flow coach, under the umbrella of the Entrepreneurs Institute, to take her profiling experience a step further, focusing on entrepreneurs and small business owners. She now uses her expertise to boost solopreneurs from great to exceptional, so they know exactly how to focus, get stuff done and protect what they’ve created using her knowledge from the intelligence world. Did you like this post, then please feel free to show a bit of cyber love and share it with your own tribe. Want to join like-minded Fierce + Fab Women in business? Then join us here! Get organised. Get Sales. Get Sane! 10 Mini Lessons in Cyber Security [basics] for Small Business. Join over 1200 small business owners who have already taken it! Are You Battle Weary? Screw The Goals. You Need A System!